I really enjoyed last week. It was a mixture of time at home and getting out and about, and it felt like we had the balance just about right. I’m really enjoying our ‘outside every day’ challenge; I wrote last week about how it really is a challenge to force ourselves outside sometimes, but it is so worth it. If you follow that link, you can see a little video of how we got on in January. Yesterday was a prime example of how, before we started this challenge, we’d have just stayed inside. It had rained for most of the day and we were all feeling a bit…meh. But I was adamant that we needed to get outside, so we went for a little walk to the shop. Via the park, of course. It was so nice to be outside in the crisp, cold air; to blow away the cobwebs. B’s photograph was taken just before we went out for our walk on Sunday. On Friday, we went into Norwich and hunted for some little teapots, cups and saucers in charity shops. I wanted them for a tuff spot that I’ve got planned. I don’t usually shop in charity shops, but M and I both really enjoyed the variety of things on offer, and the excitement of seeing if they had what we were looking for. And, of course, the bargains! 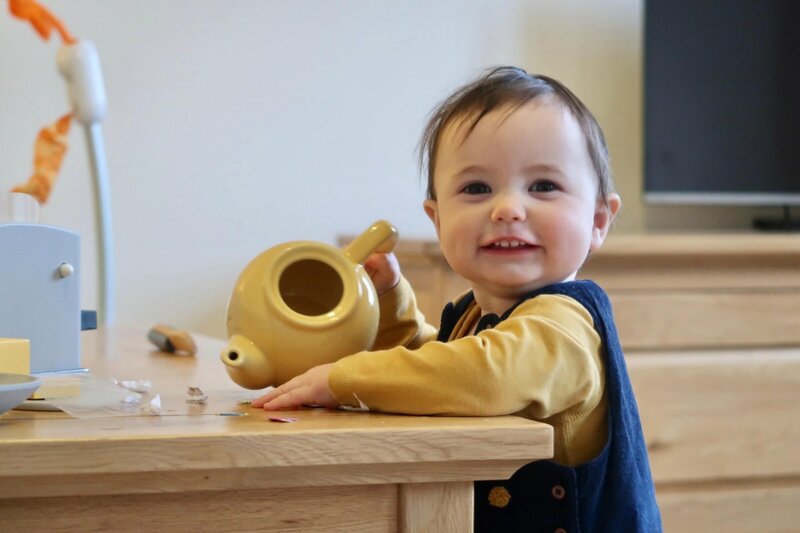 The girls have hardly stopped playing with the treasures that we bought, and in this photograph, you can see B with a teapot that M had filled with little pieces of paper, earlier in the weekend (as you do!). I was enjoying watching B peering into the teapot, reaching in to retrieve the pieces of paper, and tipping it up and shaking it. I decided to grab my camera to capture her, and as I did so, she turned to look at me. As you can see, she was feeling very pleased with herself! M’s photograph was taken on Saturday. We went to our favourite cafe in Beccles for lunch. Matthew had asked me to order him a milkshake (he always pops to the barbers for a haircut while we get settled at a table) and M overheard and asked for one, too. We are pretty (okay, very) strict with what we allow M to drink; she is only usually allowed milk or water. As a treat, she has a milk babyccino with a sprinkle of chocolate dusting on top. But she asked for a milkshake, and I agreed, thinking that as it was on the children’s menu, it would just be milk blitzed with a little fruit. Unfortunately, I was wrong, and it was just a smaller version of the adult milkshakes, which appeared to mostly consist of ice cream. Whoops! I’m not so mean that I’d take it away from her after saying she could have it though, so she just had her pudding alongside her lunch. 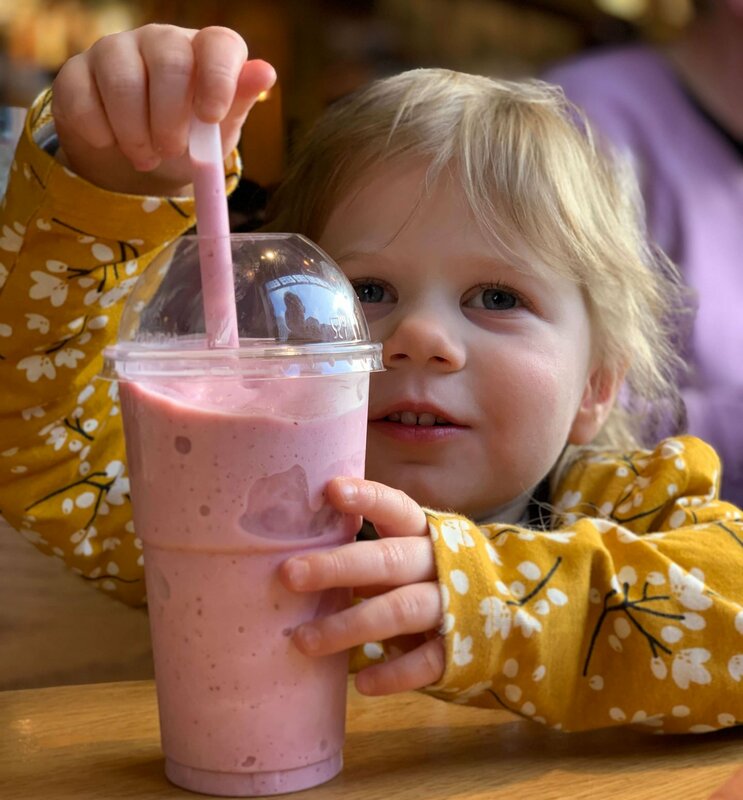 M was absolutely in her element and insisted on having her milkshake in an exact spot right next to her – I think she knew that it was a cheeky drink and was worried that we were going to take it away! This week, we’ve got lots of things planned to keep us busy, but I’m sure we’ll manage a little bit of down time, too. I hope you have a good week! "On being a stay at home parent: Mindset"
"Pondering Playtime // Simon Sock Pairs Activity"
Look at her with that milkshake, she’s like YESSSS! Very cute! I love a little trip to the charity shop, especially if I’m not looking for something specific. 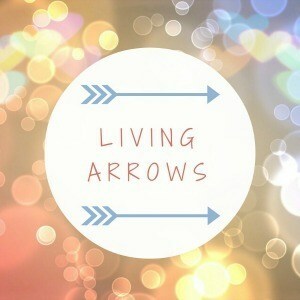 I enjoyed hunting for the things that we were looking for, but I don’t think I’d like browsing for nothing in particular. But I think that’s in the same way that I don’t really enjoy just ‘going for a walk’. I like to have a goal! I’m looking forward to getting some fruit teas in the teapots – M is obsessed with pouring, so she’s going to love it (obviously using cold water!). Awesome – an ice-cream milk shake sounds incredible. Such lovely pictures! It was delicious, but not what I would usually order for M! I know! She insisted on it being positioned in an exact spot right near the edge of the table. I think she’d have held it with one hand all the way through lunch, if we hadn’t told her we weren’t going to take it away! B looks adorable in that photo! I know what you mean about going out, especially in the rain. 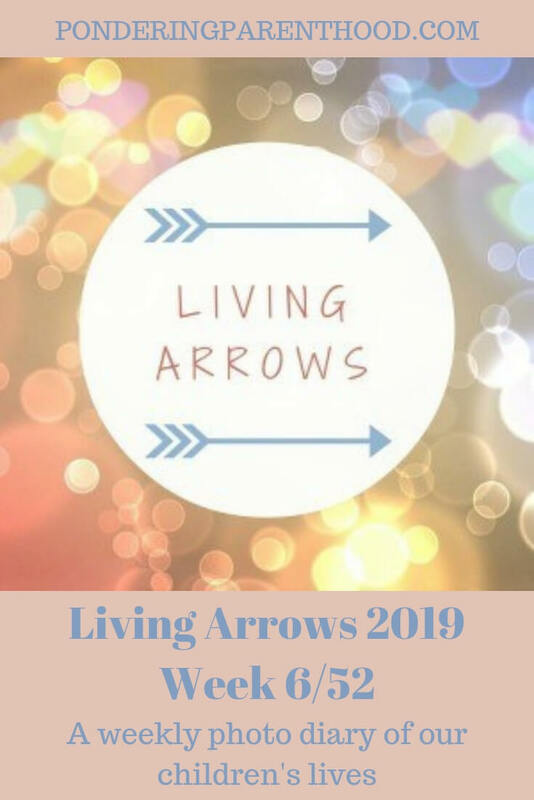 I’m so glad I joined with Living Arrows because last year we spent most of the weeks indoors, but now I have to force myself to go out and I’m quite loving it. It makes such a difference just getting that bit of fresh air. And you’re right, outdoor photos are much nicer, too! Fortunately, we generally eat quite healthily, but it is getting a bit tricky for us to have a treat, now that M is more aware of what we’re eating and drinking! I think next time we’ll ask them not to put the ice cream in hers! Yes, I couldn’t blame her really!